An optical gas imaging camera from FLIR Systems is helping a Swedish LDPE plant to visualise gas leaks in real time. Many petrochemical plants handle invisible gaseous hydrocarbons that may be toxic, flammable or explosive, or cause health issues in case of long term exposure. Leak detection is therefore, of vital importance in these petrochemical plants. The Borealis plant in Stenungsund, Sweden produces LDPE products for the cable and wire sector and has an annual production capacity of 350,000 tonnes. The Borealis cracker facility delivers the main ingredient, ethylene, which is converted into polyethylene in a high-pressure polymerisation process. Ethylene is also a highly flammable hydrocarbon. To further increase the safety within the plant and reduce the environmental impact, Borealis has purchased an optical gas imaging camera from FLIR Systems, using it as a gas leak detection tool to ensure no gas leak escapes the attention of process operators. An optical gas imaging camera is a quick, non-contact measuring instrument that can visualise gas leaks in real time. Where many other measuring instruments only present the inspector with a number, optical gas imaging cameras present visual information, making the leak detection process more intuitive. Optical gas imaging cameras can also be used in hard-to-access locations, since they can detect small leaks from a distance. 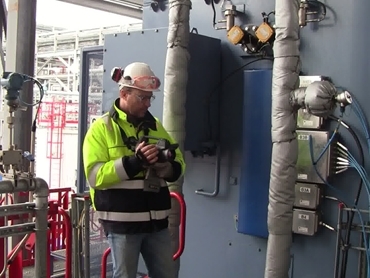 Sceptical at first about the technology, shift supervisor LDPE Jan Åke Schiller quickly realised that the optical gas imaging cameras had an immense potential for leak detection at the polyethylene plant and in petrochemical plants in general. Prior to the purchase of the FLIR GF306 optical gas imaging camera, Schiller and his colleagues used the so-called 'sniffers', devices which measure the concentration of a certain gas in one single location and generate a concentration reading in parts per million (ppm). According to Schiller, the main advantage of the optical gas imaging camera is that it detects gases visually; where sniffers just give a number, an optical gas imaging camera detects gas leakage anywhere within the field of view of the camera, speeding up inspections considerably. The Borealis plant staff is now able to do a quick scan at every startup using the optical gas imaging camera, covering approximately 80% of the entire plant in about thirty minutes. A similar scan using sniffers would need a team of ten people to work for two full days to reach the same result. However, the sniffers are still in use, with the optical gas imaging camera detecting the leak and then the sniffer used to quantify the leak. Schiller was surprised to see the sensitivity of the FLIR GF306 optical gas imaging, especially when operating in the High Sensitivity Mode; the camera can be used to detect gas leaks smaller than 100 ppm from about 70 metres, enabling the operator to perform these inspections from a safe distance. All leaks to be repaired are reported to the maintenance crews with a video file attached to the work order so that the crew will see for themselves where the leak is located. Since these inspections are much less time consuming now, Schiller uses the FLIR GF306 optical gas imaging camera for leak detection more frequently. Where they earlier conducted yearly inspections with the sniffers, taking a team of people a whole week to inspect the whole plant, a single person is now able to complete the same work using the optical gas imaging camera in just one day. They are now able to inspect the entire plant twice a year using the optical gas imaging camera in addition to performing a quick inspection at every startup. A tool that is used as often as the FLIR GF306 optical gas imaging camera at Borealis in Stenungsund needs to be lightweight, compact and ergonomically designed to prevent back and arm strain. All FLIR GF-Series optical gas imaging cameras are ergonomically designed. With its rotating handle, direct access buttons and tiltable viewfinder and LCD screen, the FLIR GF306 optical gas imaging camera is designed from the end-user's perspective, offering advanced ergonomics to improve worker safety. With a weight of 2.4kg, the FLIR GF306 optical gas imaging camera is also relatively light and compact.